EMT and CFR classes begin September 12, 2018 at the Columbia-Greene Community College. These classes are open to original and refresher students. Pre-registration is requested by email Greg at ColumbiaCountyEMTClass@gmail.com. Valatie Rescue Squad is happy and proud to announce the Deborah Simonsmeier Memorial Scholarship. We are so happy to have found a way to honor Deb’s memory. For those who have not been around EMS in Columbia County for too many years, Deb was instrumental in educating many, if not most of the EMTs in Columbia County at one point in time. If you took your EMT class here in Columbia County, it is likely you can trace your own EMT education back to Deb through a lineage of instructors that has tremendous reach. 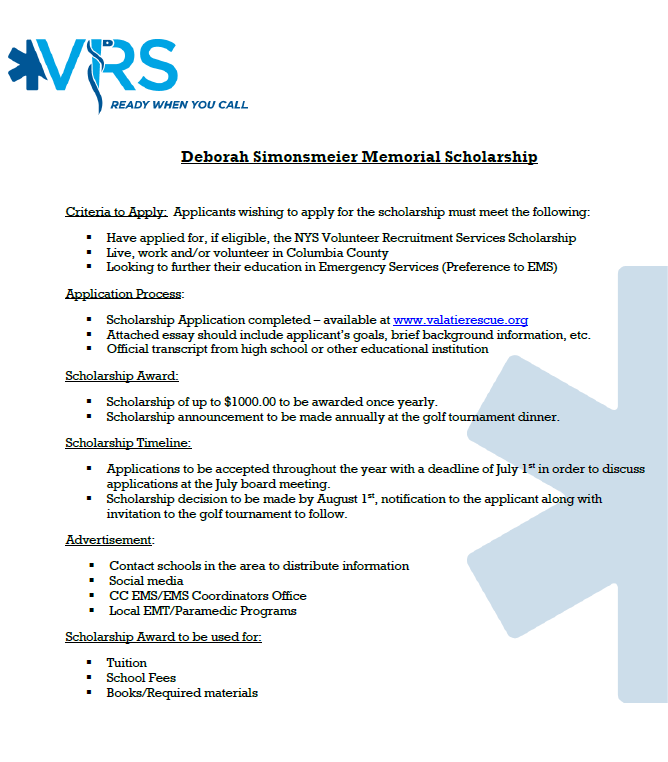 This will be the very first scholarship awarded in Deb's name, and we are excited to announce this opportunity for folks who are looking to further their education in an emergency services field. Download the application packet here. Update for the Collaborative Protocols intended as an overview of changes for EMS providers who are already using the Collaborative Protocols and a brief introduction to others. Watch the video here. This site copyright © 2000-2019 Columbia County EMS. All rights reserved.